General John Minor was born on May 13, 1761, in Caroline County, Virginia. He was just fifteen years old when America declared its independence. He served in the Revolutionary army as a mere teenager. After the war he studied law under George Wythe, a prominent Williamsburg lawyer. In 1790, Minor married Mary Berkeley, who died less than a year later. Three years later, Minor married Lucy Landon Carter. Together they raised six sons and a daughter (Blackford 204). During the War of 1812, Minor was made a general and was stationed in Norfolk.At the end of the war, he returned to his law practice. He gained prestige and was sought after for important cases in the Fredericksburg area. Minor took particular interest in a young man, Benjamin Botts, during the cross-examination of one of his trials. So impressed with him, Minor offered Botts, an orphan, a place in his home and the chance to study law. Botts came to Fredericksburg and lived with the Minor family at Hazel Hill. Within a few years, Botts passed the bar exam and soon became a renowned lawyer. Botts later served as a lawyer for Aaron Burr when he was tried for high treason (311). As a private citizen, Minor introduced two bills that strove for the emancipation of slaves. (Dates for these bills vary between 1782 and 1790. It is possible that he introduced the first one in 1782 and the second in 1790.) Both bills were approved, but further action was not taken. Later Minor granted all of his slaves freedom and sent them to Liberia at his own expense (Gordon 15). He was the first Commonwealth’s Attorney for Fredericksburg and his salary for the job was two thousands pounds of tobacco (13). From 1805 to 1807 he served as a member of the House of Burgesses. He ran for Congress against his good friend, James Monroe. Minor lost but the friendship remained. Near the time of his death in 1816, Minor sat on the Electoral College that cast Virginia’s vote for James Monroe’s second presidency. In fact, while at a dinner given for the college by the people of Richmond, Minor died shortly after starting a speech (436). General Minor was a successful lawyer and built a magnificent home, Hazel Hill, surrounded by fifty acres, close to where the marker stands now. During the Battle of Fredericksburg, the house was severely damaged. It was restored, but some time after, the house was torn down (437). 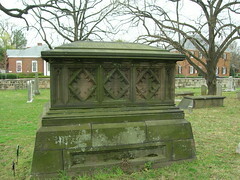 “John Minor’s grave,” Courtesy of Amy Benjamin, 2008. Blackford, Charles M. “Four Successive John Minors.” Virginia Magazine of History and Biography 10 (October 1902, January 1903, April 1903): 204, 311, 436-438. Gordon, Sue K. “Hazel Hill.” Works Progress Administration of Virginia. Historical Inventory: Spotsylvania County. vol 2, 12-17. Virginiana Room, Central Rappahannock Regional Library, Fredericksburg, VA.
Tyler, Lyon Gardiner. Encyclopedia of Virginia Biography. Vol. 5. New York: Lewis Historical Publishing Company, 1915. This entry was posted in 1700s, 1800s, Amy, Fredericksburg, Great Lives and tagged Hazel Hill, James Monroe, John Minor on March 23, 2008 by amyb.